Learn how to read the nutritional panels on pet food labels. 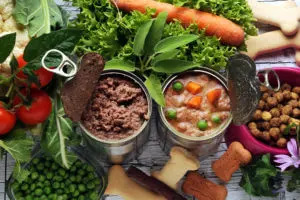 With all the different types and brands of commercial pet food available, choosing the right food for your pet can sometimes be overwhelming. Is there a difference between pet foods named “Beef Dinner” and “Beef Flavor”? How do you compare the “guaranteed analysis” on the label between diets? To help demystify the secrets of choosing the “best” pet food, it helps to understand how to read a pet food label. 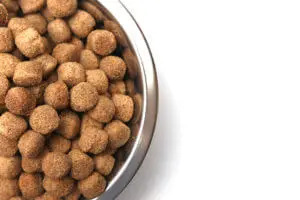 The Association of American Feed Control Officials (AAFCO) has issued specific rules and guidelines that pet food companies must follow when creating their pet food labels. These labels are comprised of two parts: the principal display panel and the information panel. The principal display panel is the part of a label most obvious to the consumer. It grabs your attention and allows you to identify the product as pet food. The principal display panel legally must contain a product identity – “designator” – and net weight. The product identity must include the product name (Chicken Recipe for Cats) and may or may not include the manufacturer’s name (W & Z Pet Food Co.) and brand name (Wally’s). The product name can hold a lot of information for the consumer. It often describes the food and can include key ingredients. However, strict rules exist about a pet food name when ingredients are included in the name. “100% Beef or All Beef” – This pet food only contains beef and water. “Beef for dogs” – This dog food contains at least 70% of the total product weight as beef. “Beef dinner, Beef platter, Beef recipe, and Beef entrée” – This pet food contains at least 25% of the total product weight as beef. “Beef and chicken dinner” – The combination of beef and chicken in the product must be at least 25% of the total product weight, and none of the ingredients can be less than 3%. There is more beef by weight in the product than chicken. “With Beef” – Beef must be at least 3% of the total weight of this product. “Beef Flavor” – The pet must be able to recognize the flavor of beef in this food, and beef is less than 3% of total product weight. A “Designator” identifies the species for which the food is intended (i.e., cat food or dog food). The net weight of the contents must also be displayed. A principal display panel can also include product vignette (visual representation of product) and/or nutritional claims. Brief nutritional claims such as “Complete and Balanced,” “100% Nutritious” and “100% Nutritionally Complete” can appear on the principal display panel as long as these claims are substantiated on the information panel. This panel is the second part of the label and must be contiguous with the principal display panel. It provides an ingredient statement, guaranteed analysis, nutritional adequacy statement, feeding directions and the name of the manufacturer or distributor. An ingredient statement lists all of the ingredients in the diet by the names and definitions accepted by AAFCO. The ingredients are listed in order of descending weight, so the heaviest ingredients appear first on the list. This can sometimes be deceiving to the consumer for several reasons. First, compare two diets with one diet (Diet A) listing whole chicken on the ingredient statement and the other diet (Diet B) listing chicken by product meal. Ingredients that go in wet (e.g., whole chicken) have higher water content than ingredients that go in dry (chicken by product meal) and so they weigh more. So whole chicken would be listed first on the ingredient statement in Diet A and would appear to be the major protein source in the diet. However, when the moisture or water content evaporates during cooking, the actual amount of chicken contributing protein and nutrients to the diet is considerably less. By comparison, in Diet B, chicken by-product meal is added in a dry form with very little moisture (5% to 8%). So chicken by-product meal would be listed lower on the ingredient statement because of the fact that it weighs less. However, all of the chicken by-product meal added is contributing to the protein and nutrients of the diet. Second, to decrease the weight of an ingredient and make it appear to be less prevalent in the diet, pet food companies will sometimes list its “split” ingredients separately. An example would be instead of listing corn as a single ingredient, a pet food company could list its “split” ingredients such as corn meal, corn flour, whole grain corn, corn gluten and/or corn gluten feed; each of which appear separately further down on the ingredient statement. The ingredient statement does not give any indication about ingredient quality, availability or digestibility. An example of this would be when a pet food includes meat by-products on the ingredient list. Meat by-products can range from poor quality ingredients (heads, bones and feet, which contain a great deal of connective tissue that is poorly digested by cats and dogs) to high quality, which contain internal organs that are easily digested and excellent sources of protein and fat. To determine the quality of ingredients that are in a pet food, you need to consult with your veterinarian and/or pet food manufacturer. You cannot get information about the quality of ingredients from the pet food label. Another aspect to consider is that some pet food companies use variable formulations with their diets. This means that the type and quality of ingredients in the same diet can vary from time to time according to availability and cost. Not every bag or can of pet food will be exactly the same. 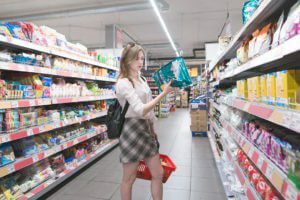 Other companies use a “fixed” formulation, which means that independent of market fluctuations and ingredient availability, their diets do not change or vary in composition. An ingredient statement does not identify whether a variable or “fixed” formulation has been used. Once again, you need to consult your veterinarian and/or the manufacturer of the pet food. 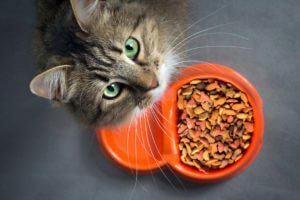 As a general rule, “fixed” formulation pet foods are more expensive than variably formulated ones. The guaranteed analysis must include minimum percentage of protein, minimum percentage of fat, maximum percentage of fiber, and maximum percentage of moisture. These numbers represent minimums or maximums, but not the actual amount of that nutrient in the diet. Measurements of protein, fat and fiber can be crude and inexact. For example, analysis of crude protein measures the nitrogen content only and does not assess protein quality or digestibility. The analysis of crude fiber is done by a simple analytical method that underestimates total dietary fiber by at least 33%. Dietary fiber represents the part of plant cells that cannot be digested by dogs and cats. It is “unavailable carbohydrate” or indigestible food. The types of fiber are soluble (large water-holding capacity) and insoluble (absorbs less water). The different types of fibers have different properties and thus different health benefits. Pet food companies incorporate soluble fibers, insoluble fibers, or a combination of both in their foods to achieve certain characteristics. However, crude fiber analysis does not measure all soluble and insoluble fibers equally and is not accurate. Moisture content must be taken into account when comparing diets, especially when comparing a dry diet to a canned diet. The moisture content of a diet helps to define it as dry (about 10% moisture) or canned (78% or less moisture). Diets should be compared on a dry matter basis (DMB). To calculate the dry matter of a nutrient in a diet, there are three easy steps to follow. First, subtract the maximum percentage of moisture from 100% to determine the percentage of dry matter. Second, divide the percentage of the nutrient from the guaranteed analysis by the percent dry matter. Finally, multiply this result by 100% to obtain the percentage of nutrient on a dry matter basis. Diet A has a higher protein level (32%) on a DMB compared to 22% on a DMB in diet B. The “formulation method” is used to verify that the diet meets the nutrient requirements for the AAFCO nutrient profile of the life stage or stages of that species. The nutrient content of the diet can be calculated from standard tables or the diet can be chemically analyzed to determine the nutrient content. The “formulation method” is less expensive and faster than a “feeding trial.” However, it is less accurate because it does not take into account loss of nutrients that occur during processing and decreased availability of some nutrients to the pet that may occur when combined with other nutrients in the diet. A “feeding trial” is the most accurate assessment of the nutritional adequacy of a diet. Feeding trials must follow specific AAFCO-recognized protocols and involve feeding a group of animals the diet for a specific amount of time and monitoring certain biochemical, hematological and physical parameters. These are examples of nutritional adequacy statements that you might see on an information panel. Feeding directions that include the frequency of feedings must appear on the label. As a minimum, feeding directions must include the statement, “Feed (weight/unit of product) per (weight only) of dog or cat.” These directions will not be appropriate for maintaining the optimum weight of every pet. You should review with your veterinarian the amount of food you should feed your pet. In addition, monitor your pet closely for any weight loss or gain and notify your veterinarian if either occurs. The pet food label must also list the name and address of the manufacturer or distributor of the food. The descriptive terms “light,” “lite,” or “low calorie” can appear on a label only if the product meets specific caloric requirements. An example is that a dry cat food cannot contain any more than 3250 kcal metabolizable energy/kg. A “reduced calories” or “less” claim must be substantiated with the name of the product of comparison and the percentage of calorie reduction. In products with terms such as “lean” or “low fat,” the amount of crude fat allowed in the diet is limited, and the “guaranteed analysis” must include a maximum crude fat guarantee as well as a minimum. “Reduced fat” or “less” can appear on a label if the name of the product comparison, percentage of fat reduction, and a maximum crude fat guarantee are listed. Always consult with your veterinarian before starting your pet on a calorie- or fat-restricted diet. He or she can help you formulate a weight loss plan for your pet. Remember, just switching your pet to a “low-calorie diet” without restricting the amount of food and calories your pet takes in will not be successful. To lose weight, your pet must consume fewer calories and expend more energy. Additional information such as statement of caloric content may also be voluntarily added. Just remember – your best source of nutritional information for your pet is your veterinarian or veterinary technician with knowledge of canine and feline nutrition. These professionals know your pet’s medical history and specific dietary needs.